Weapons are artefacts, which is to say that they are ‘man-made’, crafted by us for some end or reason. Artefacts are of two basic kinds: the aesthetic and the practical. The former are made to be admired, while the later are made because the help us achieve something, either something that we could not do unaided, or do something more cheaply, more easily, more efficiently, etc. Weapons are practical artefacts: they enable people to harm others more easily, more cheaply, more efficiently, in new ways, on a grander scale, and so forth. I am going to begin this chapter by considering weapons as (practical) artefacts, so we can better understand the kind of things they are. Weapons research, as we have seen, is an endeavour that seeks out new kinds of weapons: weapons that are altogether entirely new, like the atomic bomb and the catapult; weapons that are new variants on a type, such as the German Mauser rifle; weapons that are improvements on an existing weapon, like an improved version of the Soviet M-34 battle tank; or new or improved ancillary structures, such as the chariot and the galleon, first used as a weapons platform in the 16th century Anglo-Dutch wars. Weapons research aims to find workable designs for weapons and their ancillary structures. Threats differ from risks here in that they signify the intention to do something harmful, rather than the possibility that something harmful might happen. I have coupled risk with the design of (new) weapons but threats with improvised weapons. States threaten one another, as Iran and Syria are doing at present, though the threat here is usually conditional. However, in regard to dual use, I think we are more concerned at the moment with sub-state actors, such as terrorist organisations, using or adapting existing items for improvised weapons, as has been done with ammonium nitrate, than with states arming themselves with improvised weapons, as states do not usually need to improvise weaponry. So much by way of background. 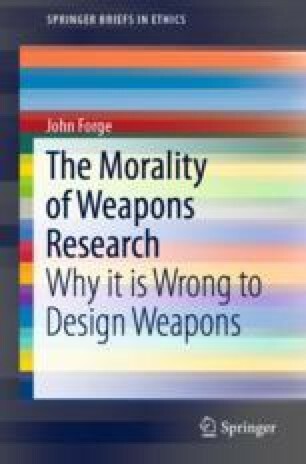 There have been a number of issues about dual use that have been discussed in the literature, but what is of interest here is whether undertaking dual use research is itself morally wrong, or whether it is morally permissible—taking advantage of dual use research and developing weapons is morally wrong. In the second place, and this is not something discussed elsewhere, are we able to express the notion of dual use with reference to our taxonomy of the purposes of artefacts and is it helpful to do so? There are examples of dual use research in a number of scientific fields, but I will choose one from nuclear physics which took place during the Manhattan Project, namely research which enabled the technologies which produced the fissile material for the bombs. This research also laid the foundation for civilian reactor technology: in fact, Enrico Fermi built the first nuclear reactor to verify that a chain reaction was possible in 1942, and nuclear reactors were built in 1944 to produce plutonium (Forge 2012: 85). The difference between what goes on when an atomic bomb explodes and when a nuclear power reactor operates is that in the former case the chain reaction is uncontrolled and energy is released until the assembly blows apart, while in the latter the energy release is gradual and controlled, heating up water to drive turbines for example. Naturally-occurring uranium will not suffice for either purpose and must be enriched. The science and technology of enrichment, and under certain circumstances the artefacts produced, are dual use. It is necessary to develop the example a little more to see why this is. Suppose a 25 kg sample N of uranium enriched to a degree greater than 20%, say 26%, is required and the necessary means to produce N set up and calibrated, and N is duly obtained.14 N is a dual use artefact because it can be used to fashion fuel rods for a research reactor, or, with some ingenuity, to make an atomic bomb. Let us ask: does N have a primary purpose and if so, what is it? The primary purpose cannot be as material for a research reactor or as material for a bomb: if N is fashioned into fuel rods and functions as such, this is not because it is material for a bomb, and if it is made into a bomb, this is not because it is material for fuel rods for a research reactor. The relation is not the same as it is between weapons as the means to harm and weapons as the means for deterrence. There is an alternative possibility. N will have a certain neutron flux, characteristic of 26% enrichment, so consider this to be the primary purpose of the artefact, to have this property. In which case both being material for fuel rods and for bombs stand as derivative purposes. Clearly, having a neutron flux of this value does not presuppose that it can be used for either fuel or for a bomb, but having a neutron flux of this (order of) magnitude is necessary for either function. Now we can ask if this is a useful way to talk about dual use, in terms of primary and derivative purposes. I believe there are some advantages in so doing. In the first place, it provides an explication of “dual use”: thus an instance of dual use comprises two functional elements that derive from the same primary element, which is to say that the each ‘dual use’ is a derivative purpose. Research can be said to be dual use as a consequence of the primary purpose of its outcome, which in turn enables the derivative, dual use, purposes. In this way we can offer an explanation of why dual use is possible. In our example, and in accordance with the definition given above, the use of N as weapons material is the bad use and as fuel rods for a research reactor the good one. We have seen that the designer is committed to the primary purpose of the artefact that she enables in the sense that this is what the artefact does, but that her motivation can come from the desire to realise a derivative purpose—for example nuclear research for reactor fuel. Dual use is problematic because research that leads to a good use can also lead to a bad use, and the assumption is that the research is motivated by the good use. This is therefore compatible with our views about the motives and intentions of the designer. Option 1-Scientists morally ought to conduct research into nuclear fission since it enables the provision of a much needed source of power for civilian purposes. Option 2-Scientists morally ought not to conduct research into nuclear fission since it led to the creation of the atomic bomb and, ultimately, nuclear weapons capable of destroying humanity (Miller 2018: 12). Option 2 could be better expressed, though one gets the point. But what is the basis of the obligation to work on the beneficial outcome, is there a principle which obliges scientists to prevent harm or convey benefit? If there were no such principle, nor any other reason to work on the beneficial aspect of the project, then there would be no dual use moral dilemma: the research would be proscribed on the basis of NMH and there would be no contending principle that promotes and justifies the work. This is precisely the implication of my account of the matter: I see no dilemmas here at all. This, of course, is a consequence of the moral framework adopted in this book which does not prescribe any action that is supposed to bring about good outcomes. I note that Miller does not put forward any such principle either. It is possible to adopt a different moral framework which does oblige people to bring about good outcomes as well as avoid bad ones, such as CP, and dual use dilemmas will only arise in such a context. Dual use research is not weapons research so it is not a main focus of interest here. But the position put forward in Chap. 3 implies that there is a sound moral reason not to conduct dual use research, because it risks weapons development, and since there is no other reason to undertake such work, no moral rule, the present account implies that dual use research is morally wrong. There are, as far as we know, no lethal autonomous weapons (LAWS) in existence at present. One can speculate about just what kind of things LAWS will be. I will not go down this path, but just think of LAWS on analogy with drones, drones that are capable of choosing and carrying out missions autonomously, without a pilot.15 Such systems will have to have learning capabilities and flexible programming. This category of weapon is of current interest, and there have been appeals to ban the research and development of LAWS because of concerns specific to this particular kind of weapon. As far as we are concerned, WRMR applies to LAWs because they are weapons and our principle applies to all weapons research, so no one should design such weapons, and we can agree with those who call for bans on any research into LAWS. In this regard there is nothing special about LAWS. It is nevertheless worth discussing LAWS here because of one of the reasons why bans have been called for is the possibility that when LAWS are used no one would be responsible for what they do, especially if they make mistakes and kill the wrong targets—there may, it is alleged, be responsibility gaps . If mistakes mean that the weapons has malfunctioned, then some like Robert Sparrow think that the designer is an “obvious and important possible endpoint for the allocation of responsibility” (Sparrow 2007: 178). I am inclined to agree with him, but there is a little more we can add to the discussion on the basis of our account of designer responsibility. Much of the discussion around this issue, and about LAWS more generally, has focussed on autonomy and the senses and ways in which LAWS could be autonomous. Gubrud has suggested that landmines represent a good starting point for talking about LAWS because they are autonomous in the sense of not being triggered by their operator, and there have been other useful contributions.16 For the present purpose it is not necessary to canvas these alternatives. It is sufficient to assume that a weapon is autonomous if it selects its targets as well as launching whatever ordnance it is equipped with. In other words, something is a LAW if it decides who to kill. So for instance, it could be something that functions in the same way as the current generation of drones, in every way except that there is no pilot, no sensor analyst and no intelligence officer (see Gusterson 2016: 33). If a drone killed the wrong people, then it might be that the pilot, the intelligence officer, or the sensor operator would be called to account, but these persons are ‘out of the loop’ when it comes to LAWS. Traditionally, the operator/designer of a machine is held (morally and legally) responsible for its operation. Autonomous learning machines … create a situation where the designer is in principle not capable of predicting the future machine behaviour and thus cannot be held morally responsible for it. The society must decide between not using this kind of machine any more … or facing a responsibility gap which cannot be bridged by traditional concepts of responsibility ascription (Matthias 2004: 175). I left as an open question the responsibility of the designer for the harms caused when her weapon is actually used. Thus in the case of the bomb designer D, I said that if she designed a bomb for a specific target which was then used for that end, then she is responsible for the harm caused. Similarly, if she knew that a bombing campaign was planned and designed bombs for the group, but did not know anything about the specific targets, then we should also hold her responsible for the harms. It would seem however as the harming events become more remote from the time and place where the bomb design takes place, it becomes increasingly difficult to hold D responsible for the harms caused as well as for designing bombs. This accords with the received view of responsibility. In general, if agent P does not know about the outcomes or consequences of her action when she performs the action, then it may appear unfair if she is held accountable for them. So it seems we should accept: P did not know that by doing X, Y would come about, therefore P is not morally responsible for Y and so cannot be held to account if Y is harmful—this (Aristotelian condition) is implicit in the passage from Matthias. I argued in my book The Responsible Scientist that ignorance does not always excuse and that we need a ‘wide view’ of responsibility in which an agent who is in a ‘position to know’ about the consequences of her action, and who should have known what these are, can be held to account. If P is a designer and what she does is design an artefact, which is then used as it is supposed to be used, then evidently she is in a position to know this. That is to say, she is in a position to know that what she designs will work or function in the way she intended it to be used, given that she designed it properly, even if she was not in a position to know all its particular uses and applications, stretching into the future. For virtually all artefacts, such issues about responsibility and accountability will not be either interesting or important. Matters are different when it comes to weapons research. Expressing the issue in the light of this account of responsibility, if the designer of a LAW has no reason to suppose that her weapon will ‘malfunction’ by selecting and killing the wrong target, can she be held responsible? To answer this question, we need to ask first who is responsible when the LAW selects and kills the ‘right’ target, those who it has been flexibly programmed to seek out and destroy. And here the issues are the same as they are when weapons are used that require human decision-making to select targets, including the soldiers, those in the chain of command, and those who provide support and logistics for the mission in question. The weapons designer is also responsible if she was in a position to know about the mission. In regard to LAWS, we can speculate about how this might be the case: suppose the mission is to target insurgents in the tribal homelands of Pakistan, where the majority of drones are now employed. The designer of the LAWS needs to be aware of this because it sets some of the flexible programming parameters—LAWS need to know where they are. In which case the designer is responsible for the harms her creations cause, regardless of who is killed, whether or not the right targets have been destroyed, because in the first instance it is always wrong to harm. The next question is whether or not the harming is justified, and the assumption is that if innocents are killed—the ‘wrong targets’—then it is not but if insurgents are killed, then it is. There is room for dispute and debate, but this is not the issue here. It is the situation that is the converse of that just considered that is the interesting one: suppose the designer is not in a position to know about a given mission, and so would not according our account of the matter be held responsible for the harm caused in the normal course of events, but now the wrong targets are selected and engaged and innocents are killed. Is the designer responsible? There are two approaches possible here, one of which appears to give rise to responsibility gaps and one that does not. The first sees the LAW as analogous to a soldier who kills an innocent person. If his commander had no reason to think he was not properly trained, subject to stress, or that there was anything else to impair his ability to carry out his mission, then the responsibility for killing the wrong person rests squarely with the soldier, he is accountable. If the soldier is replaced by a LAW in a comparable situation, then it looks as if no one, or nothing, can be held to account, and there is a ‘responsibility gap’. The second approach sees the LAW on analogy with the weapon the soldier uses. Suppose this is some kind of missile with a guidance system and it goes astray and hits the wrong target. If the system is faulty and the problem is not the soldier’s aim, then the question of the designer’s responsibility is relevant. And the same is true for a LAW. If these engage and kill the wrong targets, then they are faulty, they do not work as they should and the designer is accountable. There is no responsibility gap. I opt for this second option and hence I endorse Sparrow’s view of the matter and I think Matthias is wrong in his assessment of responsibility for autonomous learning machines when these malfunction, at least when it comes to LAWS. Gubrud, M. 2018. The Ottawa Definition of Landmines as a Start to Defining LAWS. https://autonomousweapons.org/the-ottawa-definition-of-landmines-as-a-start-to-defining-laws/. Reaching Critical Will. 2018. Documents from the 2018 CCW Group of Government Experts on Lethal Autonomous Weapons Systems. http://www.reachingcriticalwill.org/disarmament-fora/ccw/2018/laws.